Agamben, Giorgio. The Kingdom and the Glory: For a Theological Genealogy of Economy and Government. Stanford: Stanford University Press, 2012. Ackerman, James S. The Villa: Form and Ideology of Country Houses. Princeton: Princeton University Press, 1990. Arendt, Hannah. The Human Condition. Chicago: University of Chicago Press, 1998 . Aureli, Pier Vittorio. The Possibility of an Absolute Architecture. Harvard: MIT Press, 2011. Bialasiewicz, Luiza. ‘The Geographies of production and the contexts of politics: dis-location and new ecologies of fear in the Veneto città diffusa.’ Environment and Planning D: Society and Space, vol. 24 (2006): 41–67. Bonomi, Aldo. Il capitalismo molecolare. Turin: Einaudi, 1997. Branzi, Andrea. Modernità debole e diffusa. Milan: Skira, 2006. Corboz, André. ‘Le Territoire comme palimpseste’, Casabella 516 (1985): 22–27. Djalali, Amir. ‘Prehistories of Common Space: Conflict and Abstraction in Renaissance Architecture’ in The City as a Project, ed. Pier Vittorio Aureli, 102–136. Berlin: Ruby Press, 2013. Elden, Stuart. The Birth of Territory. Chicago: University Of Chicago Press, 2013. Glossary of the Council of Supply Chain Management Professionals, www.cscmp.org. Gregotti, Vittorio. ‘Architettura come modificazione.’ Casabella 498–499 (1984): 2–7. Innocenti, Raimondo.ed. Piccola città e piccola impresa. Milan: Franco Angeli, 1985. Koolhaas, Rem, Stefano Boeri, Sanford Kwinter, Nadia Tazi, and Hans Ulrich Obrist. Mutations: Rem Koolhaas, Harvard Project on the City, Stefano Boeri, Multiplicity, Sanford Kwinter, Nadia Tazi, Hans Ulrich Obrist. Barcelona: ACTAR, 2000. Lord, Carnes. Aristotle’s Politics. Chicago: University of Chicago Press, 2013. Mandurino, Katy. ‘Da abbattere o riconvertire. La scelta del Veneto sui capannoni vuoti.’ Il Sole 24 Ore, 9 February 2018. Marullo, Francesco. ‘Logistics Takes Command. Architecture, Warfare, Abstraction.’ Log 35 (Autumn 2015): 103–120. Munarin, Stefano, and Maria Chiara Tosi. Tracce di città. Milan: Franco Angeli, 2002. Negri, Antonio, and Michael Hardt. Empire. Harvard: Harvard University Press, 2000. Palladio, Andrea. I quattro libri dell’architettura. Milan: Enrico Hoepli Editore, 2014 . Pasolini, Pier Paolo. Saggi sulla politica e sulla società. Milan: Mondadori, 1999. Pollione, Marco Vitruvio. De Architectura trans. L. Migotto. Pordenone: Edizioni Studio Tesi, 1999 . Schmitt, Carl. The Nomos of the Earth in the International Law of the Jus Publicum, trans. G. L. Ulmen. Candor, NY: Telos Press, 2003 . Secchi, Bernardo. ‘Progetto di suolo.’ Casabella 520 (1986): 19–23. Viganò, Paola. ‘Water and Asphalt, The project of Isotropy in the Metropolitan Region of Venice.’ Architectural Design, vol. 78 (2008): 34–39. Viganò, Paola. I Territori dell'urbanistica. Il progetto come produttore di conoscenza. Milan: Officina, 2010. Marcello Tavone is an architect and urban designer based in Paris. He studied at the Technische Universiteit Delft (NL) and at IUAV in Venice, where he graduated in ‘Architecture for the city’. By collaborating with the Parisian offices of l’AUC, Dominique Perrault Architecture and Wilmotte & Associes he has been able to develop projects on various scales: from prospective metropolitan research, to master-planning, public/private partnership, conceptual studies and curating. Marcello collaborated with Architecture d’Aujourd’hui and he was invited as guest critic at the Ecole Speciale d’Architecture in Paris. In 2018 he founded‘ON CITIES’, an office for architecture and urban design. TAVONE, Marcello. HomeWorks. FOOTPRINT, [S.l. ], p. 131-146, nov. 2018. ISSN 1875-1490. Available at: <https://journals.open.tudelft.nl/index.php/footprint/article/view/2036>. Date accessed: 21 apr. 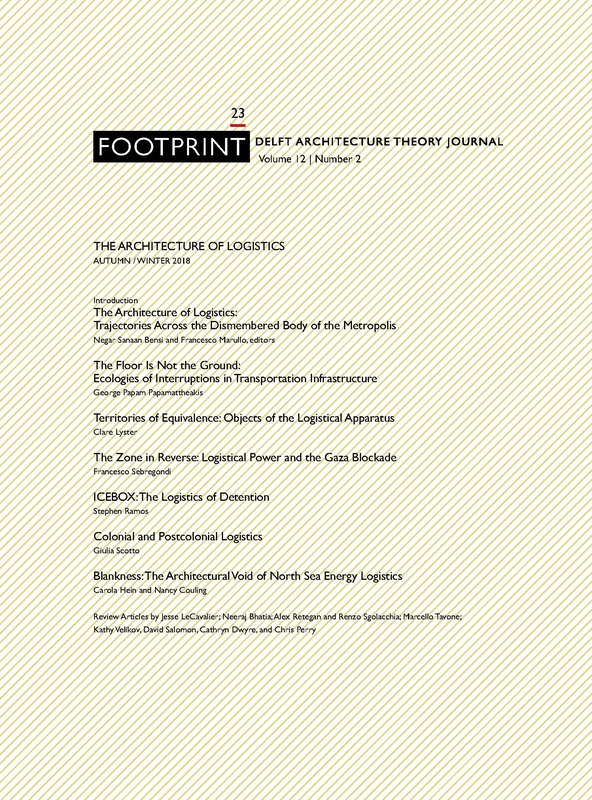 2019. doi: https://doi.org/10.7480/footprint.12.2.2036.